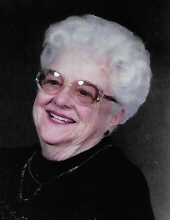 SWEENEY, Virginia Ruth - Age 98, of Westland formerly of Swartz Creek, died Wednesday, April 10, 2019. Funeral services will be held 11:00 AM Thursday, April 18, 2019 at Sharp Funeral Homes, Fenton. Pastor Jeff Cardimen and Pastor Norm Long officiating. Visitation will be held at the funeral home Wednesday from 4-7 PM where a American Legion Memorial Service will be held at 7 PM. In lieu of flowers those desiring may make contributions to the Alzheimer's Association or Angela Hospice, 14100 Newburgh Road, Livonia, MI 48154. Virginia was born October 14, 1920 in Grand Blanc, the daughter of Horace Perry and Gladys Eva (Warner) Baker. She married Wilbur "Bill" Sweeney October 18, 1941 in Swartz Creek and he preceded her in death November 13, 1987. She retired as a school secretary in Charlotte, NC and then was a real estate agent in Kentucky. Virginia was a member of St. Mary Queen of Angels Catholic Church where she was involved in the 50 and Over Group and the Catholic Women's Ministry. She also was a member of the Swartz Creek American Legion Auxiliary. Surviving are; her daughter, Ginger and husband Chuck Krappitz of Canton; grandchildren, Kim Hassell, Jeff Krappitz, Donald and wife Erica Sweeney, and Debbie and husband Jason Sprawka; several great grandchildren; and several nieces and nephews. She was also preceded in death by her parents; son David Sweeney; brothers, Warner, Kenneth, and Bruce Baker; sister, Dorothy Tilden. Tributes may be shared at www.sharpfuneralhomes.com. To send flowers or a remembrance gift to the family of Virginia Ruth Sweeney, please visit our Tribute Store. "Email Address" would like to share the life celebration of Virginia Ruth Sweeney. Click on the "link" to go to share a favorite memory or leave a condolence message for the family.